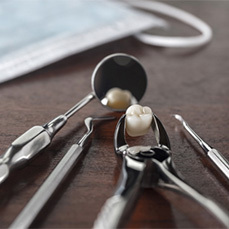 Wisdom teeth extractions are a common procedure. In fact, they have become a sort of rite of passage for many young adults. Still, you might wonder what exactly the wisdom teeth are, why they often need to be removed, and what you can expect if you must undergo the extraction procedure. This page explains everything you need to know about your wisdom teeth. The wisdom teeth are the third set of molars, located at the very back of the mouth. Most people have four wisdom teeth, while others may have just one or two. These teeth develop long after the other permanent teeth erupt, when a person is a bit older and “wiser” than they were in earlier years. Wisdom teeth often need to be removed because most people’s mouths are too small to accommodate them. They can therefore push the other teeth out of alignment, increase the risk of infection, and lead to decay on the adjacent teeth. Removing the teeth can prevent such issues. Wisdom teeth do not always cause problems. Indeed, many people are able to retain them for a lifetime and experience no ill effects. During your routine checkups, your family dentist near Pantego and Dalworthington Gardens will examine your wisdom teeth and let you know if we believe they need to be removed. If you are thinking about getting your wisdom teeth extracted as a purely precautionary measure, we’ll discuss all of the pros and cons of the procedure with you so you can make a full informed decision. Most people who get their wisdom teeth extracted do so in their late teens or early 20s, but it isn’t uncommon for older adults to undergo the procedure. What Happens During the Extraction Process? Patient comfort is one of our priorities. That is why we offer three different types of sedation to help our patients remain calm and relaxed during major dental procedures, such as wisdom teeth extractions. We’ll also administer local anesthesia to numb the area where we’re working. Once we’re sure you’re comfortable, Dr. Shah will get to work on removing the teeth. She may have to create an incision in the gums and/or break the teeth into pieces in order to extract them. After your procedure, you can expect to be a little sore for a few days to a week. It’s important that you get plenty of rest, eat soft foods, and avoid tobacco and drinking straws. Feel free to call our team if you have any questions or concerns during your recovery period. The cost of your procedure will depend on the type of sedation used, how many wisdom teeth Dr. Shah is removing, and whether the teeth are impacted (stuck beneath the gum line). Removing four impacted wisdom teeth may cost a couple thousand dollars. Fortunately, dental insurance may pay for up to half of this restorative procedure. If you do not have insurance, ask us about financing or our VIP savings plan.